MOBILE, AL – The first round of the 2018 NFL Draft is in the books, and surprising picks were made across the board. From the No. 1 overall pick in Baker Mayfield to the final pick of the first round, Lamar Jackson, the draft was not what experts projected just a week ago. The Cleveland Browns selected Heisman Trophy winner QB Baker Mayfield with the first pick, and Ohio State CB Denzel Ward with the fourth pick. Penn State RB Shaquon Barkley went second to the New York Giants, the New York Jets picked USC QB Sam Darnold third overall and Bradley Chubb, the DE from NC State, went fifth to the Denver Broncos. Ten players from the SEC were drafted in the first round, which is the most of any conference. Four players from Alabama were chosen in the first round. Alabama safety Minkah Fitzpatrick, defensive tackle Da’Ron Payne, linebacker Rashaan Evans, and wide receiver Calvin Ridley all went in the first round. 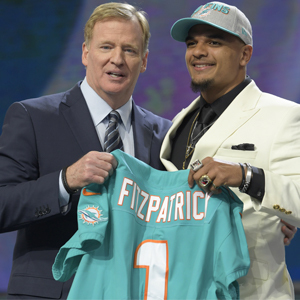 The Miami Dolphins picked Fitzpatrick with the 11th pick, Payne went 13th to the Washington Redskins, Evans was picked 22nd by the Tennessee Titans, and the Falcons took Ridley 26th. The second and third rounds of the 2018 NFL Draft continue Friday at 6 p.m. and rounds four through seven will take place Saturday at 11 a.m. Players like South Alabama safety Jeremy Reaves and Troy quarterback Brandon Silvers are still up for grabs. Below is a full list of all the picks from Thursday night’s first round picks. For more on the 2018 NFL Draft, be sure to tune in to Sports Drive on WNSP weekday afternoons from 3 p.m. to 6 p.m.